SAP SE announced its preliminary financial results for the fourth quarter ended 31 December 2018. Even after multiple guidance raises during the year SAP met or exceeded all of its 2018 outlook metrics. For the full year new cloud bookings were €1.81 billion, up 25% (up 28% at constant currencies). Cloud subscriptions and support backlog increased 30%, reaching €10 billion at year-end. Cloud subscriptions and support revenue was €4.99 billion (IFRS) or €5.21 billion (non-IFRS at constant currencies), achieving the full year outlook (€5.15 to €5.25 billion non-IFRS at constant currencies). Software revenue decreased 5 % year over year to €4.65 billion (IFRS), flat year over year (non-IFRS at constant currencies). New cloud and software license order entry exceeded €10 billion and grew by 14% at constant currencies year over year in the full year. Cloud and software revenue was €20.62 billion (IFRS) or €21.58 billion (non-IFRS at constant currencies), exceeding the full year outlook (€21.15 to €21.35 billion non-IFRS at constant currencies). Total revenue was €24.71 billion (IFRS) or €25.96 billion (non-IFRS at constant currencies), exceeding the full year outlook (€25.20 to €25.50 billion non-IFRS at constant currencies). SAP’s rapidly expanding cloud business together with solid growth in support revenue continued to drive the share of more predictable revenue. The total of non-IFRS cloud subscriptions & support revenue and non-IFRS software support revenue was 65% of non-IFRS total revenue for the full year 2018, up 2 percentage points. For the full year, operating profit was €5.71 billion (IFRS) or €7.48 billion (non-IFRS at constant currencies), achieving the full year outlook (€7.425 to €7.525 billion non-IFRS at constant currencies). Earnings per share increased 2% to €3.42 (IFRS) and decreased 2% to €4.35 (non-IFRS). Operating cash flow for the full year was €4.30 billion, a decrease of 15% year over year. Free cash flow decreased 25% year over year to €2.84 billion. At year end, net liquidity was –€2.49 billion. In the fourth quarter, new cloud bookings were €736 million, up 25% (23% at constant currencies). Cloud subscriptions and support revenue grew 41% year over year to €1.41 billion (IFRS), up 40% (non-IFRS at constant currencies). Software revenue grew 1% year over year to €2.09 billion (IFRS), up 8% (non-IFRS at constant currencies). New cloud and software license order entry grew 18% at constant currencies year over year. Cloud and software revenue grew 9% year over year to €6.32 billion (IFRS), up 11% (non-IFRS at constant currencies). Total revenue grew 9% year over year to €7.43 billion (IFRS), up 13% (non-IFRS at constant currencies). In the fourth quarter operating profit increased by 22% year over year to €2.40 billion (IFRS), up 8% (non-IFRS at constant currencies). Earnings per share decreased 8% to €1.41 (IFRS) and decreased 15% to €1.51 (non-IFRS). SAP’s three reportable segments “Applications, Technology & Services”, “Customer Experience” and “SAP Business Network” showed the following performance. In the fourth quarter, segment revenue in ATS was up 6% to €6.26 billion year over year (up 10% at constant currencies). Solutions which contributed to this growth in the fourth quarter are listed below. SAP S/4HANA is at the core of the Intelligent Enterprise. With S/4HANA, customers automate more and more of their business processes enabling employees to focus on higher-value tasks. It detects patterns, predicts outcomes and suggests actions empowering companies across all industries to reinvent their business models for the digital economy. S/4HANA adoption grew to approximately 10,500 customers, up 33% year over year. In the fourth quarter, more than 40% of the additional S/4HANA customers were net new. S/4HANA continues to be selected by world-class global companies, including Verizon Wireless, Cargill, Infosys, and Nestlé. Hilti and Haribo went live with S/4HANA this quarter. A growing number of companies including Sonos have chosen S/4HANA in the Cloud. Hitachi High Technologies went live on S/4HANA Cloud in the fourth quarter. SAP delivers total workforce management across both permanent and contingent labor. The SAP SuccessFactors suite is localized for 94 countries and 42 languages. SAP SuccessFactors Employee Central, which is the flagship of SAP’s HCM offerings, added more than 250 customers in the quarter and has now more than 3,000 customers globally. Competitive wins included Volkswagen, Volvo, Stadt Zürich, Yahoo Japan, and State of Illinois. Commerzbank went live with SAP SuccessFactors Employee Central in the fourth quarter. In Q4, SAP SuccessFactors was named a 2018 Gartner Peer Insights Customers’ Choice in the Cloud HCM Suites for Midmarket and Large Enterprises category. SAP Leonardo brings together cutting-edge technologies – AI, Machine Learning, IoT, Big Data, Advanced Analytics and Blockchain – with deep process and industry expertise, delivering completely new ways of working and powering the Intelligent Enterprise. Companies like Barclaycard are among many others that adopted SAP Leonardo solutions in the fourth quarter. SAP Digital Platform includes SAP Cloud Platform and SAP Data Management Solutions. With SAP HANA’s data rich and real-time in-memory architecture as the foundation, this represents a massive opportunity to drive full use of HANA. The SAP Cloud Platform facilitates new app development, extensions and seamless integration. It orchestrates “hybrid” customer landscapes across on premise and cloud. The SAP Data Hub is the “enterprise control tower” bringing together multi-source data including unstructured to provide a 360-degree view of all company data and manages compliance and governance policies from one central location. Gartner recently recognized SAP as a strong leader in its Magic Quadrant for Operational Database Management Systems (OPDMS) for the 6th consecutive year. Vorwerk & Co. and Sichuan Changhong Electric adopted SAP’s Digital Platform solutions in the fourth quarter. In the fourth quarter, SAP’s C/4HANA customer experience solutions achieved triple-digit growth in cloud subscription revenue year over year. Segment revenue in Customer Experience was up 52% to €349 million year over year (up 50% at constant currencies). The Callidus acquisition is reflected in these segment numbers. SAP’s C/4HANA solutions serve a wide range of industries across both B2C and B2B and enable businesses to manage their entire front office: marketing, sales, commerce, service, customer data cloud – seamlessly and in real-time. C/4HANA provides companies with a single, complete view of their customer across all channels and connects demand to the fulfillment engine in one end-to-end value chain. McLaren Group, National Geographic, Prada, Rubbermaid and Dyson were among those that chose SAP’s C/4HANA solutions this quarter. In the fourth quarter, segment revenue in SAP Business Network was up 26% to €721 million year over year (up 24% at constant currencies). 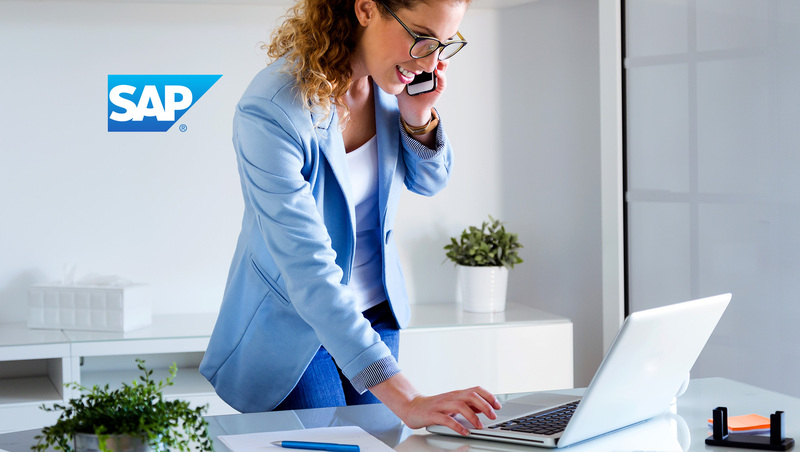 With the SAP Business Network SAP provides collaborative commerce capabilities (SAP Ariba), effortless travel and expense processing (SAP Concur) and flexible workforce management (SAP Fieldglass). SAP Business Network is the largest commerce platform in the world with more than $2.9 trillion in global commerce annually transacted in more than 180 countries. Uber and Coca Cola European Partners chose SAP’s Business Network Solutions in the fourth quarter. (Non-IFRS) Actual Currency ∆ in % ∆ in % const. curr. Actual Currency ∆ in % ∆ in % const. SAP had a solid performance in the EMEA region with cloud and software revenue increasing 6% (IFRS) and 7% (non-IFRS at constant currencies). Cloud subscriptions and support revenue was strong and grew by 40% (IFRS) and 39% (non-IFRS at constant currencies) with Germany, Spain and Middle East and Africa being highlights. In addition, SAP had strong software revenue growth in the UK, Italy and Sweden. SAP had an exceptional performance in the Americas region. Cloud and software revenue increased by 14% (IFRS) and increased by 20% (non-IFRS at constant currencies). Cloud subscriptions and support revenue increased by 41% (IFRS) and 38% (non-IFRS at constant currencies). The United States, Brazil and Mexico were highlights for both cloud subscriptions and support revenue as well as software revenue. In the APJ region, SAP had a solid performance. Cloud and software revenue was up by 5% (IFRS) and grew by 6% (non-IFRS at constant currencies). Cloud subscriptions and support revenue was exceptional and grew by 48% (IFRS) and 50% (non-IFRS at constant currencies). Greater China and Japan had strong quarters in both cloud subscriptions and support revenue and software revenue. 1) For a detailed description of SAP’s non-IFRS measures see Explanation of Non-IFRS Measures online. For a breakdown of the individual adjustments see table “Non-IFRS Adjustments by Functional Areas” in this Quarterly Statement. 2) As this is an order entry metric, there is no IFRS equivalent. Due to rounding, numbers may not add up precisely. Non-IFRS cloud subscriptions and support revenue is expected to be in a range of €6.7 − €7.0 billion at constant currencies (2018: €5.03 billion), up 33% – 39% at constant currencies. Non-IFRS cloud and software revenue is expected to be in a range of €22.4 – €22.7 billion at constant currencies (2018: €20.66 billion), up 8.5% – 10% at constant currencies. Non-IFRS operating profit is expected to be in a range of €7.7 – €8.0 billion at constant currencies (2018: €7.16 billion), up 7.5% – 11.5% at constant currencies. In addition, SAP expects total revenues to increase strongly, at a rate slightly lower than operating profit. The comparative numbers for 2018 do not include Qualtrics. Callidus revenue and profits are included in the comparative numbers from the April 5th, 2018 acquisition close date. While SAP’s full-year 2019 business outlook is at constant currencies, actual currency reported figures are expected to be impacted by currency exchange rate fluctuations as the Company progresses through the year. See the table below for the Q1 and FY 2019 expected currency impacts. Looking beyond 2019, SAP is updating its 2020 ambition last provided in July 2018. This update reflects the Company’s consistent fast growth in the cloud, strong cloud & software momentum and operating profit expansion as well as the Qualtrics acquisition. The Company is also introducing a 2023 ambition. All numbers are based on 2018 currencies. SAP will discuss the key drivers behind the long-term growth aspirations at its Capital Markets Day in New York on February 7th, 2019 and in its Integrated Report 2018 and its 2018 Annual Report on form 20-F, each which is scheduled to be published on February 28th, 2019. In 2019, SAP will further increase focus on its key strategic growth areas. For the first time since 2015, SAP will execute a company-wide restructuring program to further simplify company structures and processes and to ensure its organizational setup, skills set and resource allocation continue to meet evolving customer demand. Restructuring expenses are projected to be €800 million to €950 million, the vast majority of which will be recognized in the first quarter 2019. Excluding restructuring expenses, the program is expected to provide a minor cost benefit in 2019 and €750 million to €850 million in annual cost savings as of 2020 that will fuel investments into strategic growth areas. The expected cost savings and reinvestment are fully reflected in SAP’s financial outlook and ambitions. As of January 1st, 2019, SAP adopted the new IFRS standard on lease accounting (IFRS 16 ‘Leases’). Under the IFRS 16 adoption method chosen by SAP, prior years are not restated to conform to the new policies. Consequently, the year over year changes in profit, assets and liabilities and cash flows in 2019 will be impacted by the new policies. Operating expenses and consequently operating profit are expected to experience a benefit of substantially less than €0.1 billion. Finance costs are expected to increase and net financial income is consequently expected to decrease by an amount very similar to the benefit in operating profit. Thus, the impact on profit before tax, profit after tax and earnings per share is expected to be inconsequential. IFRS 16 is also expected to impact SAP’s cash flow statement: operating cash flow for full year 2019 is expected to increase and cash flow from financing activities is expected to decrease by approx. €0.3 − €0.4 billion. SAP plans to adjust the definition of its Free Cash Flow metric in a way that it is not affected by this change in cash flow classification. More disclosures on our adoption of IFRS 16 will be provided in our Consolidated Financial Statements 2018 which will be part of our Integrated Report and our Annual Report on Form 20-F. Further insight into the IFRS 16 impact on SAP’s financials in 2019 will be provided in the respective Quarterly Statements and the 2019 Half Year Report as well as the 2019 Integrated Report.